Injo Kim was inspired by everyday heroes when he led the team that designed the Chevrolet Beat concept, which debuts today at the New York Auto Show. 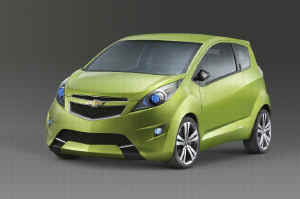 The Chevrolet Beat is a front-wheel-drive, three-door hatchback wrapped in a bright Vertigo Green exterior finish that exudes energy and extends into the interior. The overall mood of the exterior and interior design is that of a high-performance, high-tech micro tuner car, with fascias, rocker panels, lamps and wheels enhanced for personalization, a strong trend among buyers in this market. The Beat exterior lines convey speed, with a fast, dramatic, sloping rake from the top of the rear spoiler down to the hood, and elongated front LED headlamps that seem to extend from the base of the twin-port grille to the A-pillar. Integrated door handles set flush within the B-pillar give the doors a clean, uncluttered look. Big, bold, 17-inch wheels are pushed to the corners, and brake calipers in matching Vertigo Green provide a dash of drama at the wheels. The rear fascia carries Chevrolet�s trademark twin taillamps; these LED lamps are set vertically, extending just under the rear glass. The high energy continues inside the Tachyon Black/Titanium interior with a wraparound dash in Vertigo Green, and a dashboard that features color-coordinated fabric. The green is further pulled through with contrasting stitching on the fabric and mesh seats. The black headliner features fiber-optic lights that create a �star� effect. Young buyers expect technology, and the Beat delivers, with a center stack that has a pop-up feature. When pushed up, the door reveals a navigation system and when pushed down it reveals a useful center storage compartment. The premium Alpine sound system features six speakers and a trunk-mounted subwoofer. �The sound system and the pop-up juke box will always make you the life of the party,� said Sungtae Baek, interior designer for the Chevrolet Beat. Keeping the Beat on the move is a 1.2-liter turbocharged gas engine mated to an automatic transmission.